A major international collaboration, including AORI researcher Dr. Alex Wyatt and authors from 20 other countries, could help global efforts to overturn recent declines in the world’s shark population by providing greater insight into the feeding habits of the world’s most misunderstood fish. Led by Dr. Christopher Bird from the University of Southampton, the study published in Nature Ecology & Evolution, used chemical markers in the form of carbon isotopes found in sharks to investigate where in the world they have been feeding – an unresolved question for many shark species. Knowing which parts of the global ocean are important shark feeding areas may help to design more effective conservation measures to protect declining shark populations. Distribution of compiled shark data and plankton isotopes from Bird et al. (2018) Nature Ecology & Evolution. 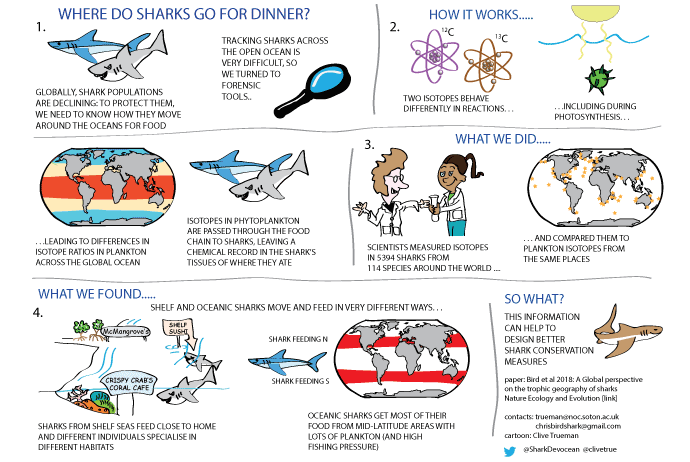 “If an animal feeds in the same place where it was caught, the carbon isotope signals in the shark and phytoplankton will match.,” says Dr Bird whose PhD research was focused on deep-sea sharks. “However, if the shark has moved between feeding and where it was caught, then the signals will be different. “You’ve heard of ‘you are what you eat’ – well this is more ‘you are where you ate’”, Bird continued. 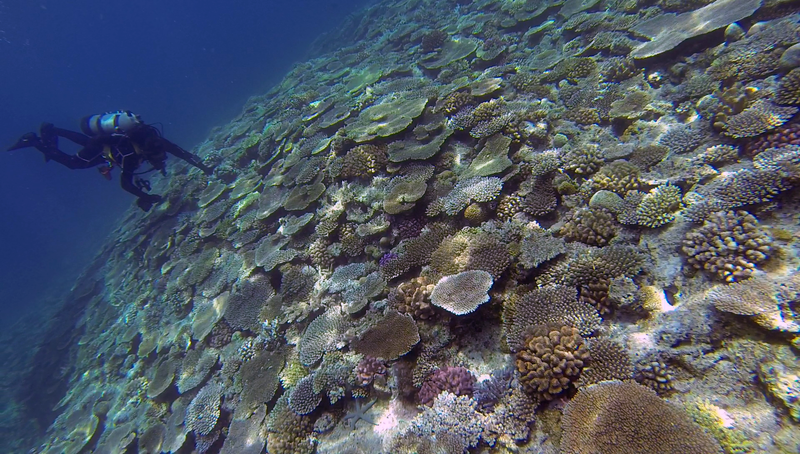 “We were able to show that sharks living close to land and those that live in the open ocean have very different ways of feeding. The global study used muscle tissues to show that sharks living near to the coast feed locally across a range of different food webs –this is like people living in a city with access to lots of different restaurants in the neighbourhood and no need to travel far to find the food they want. On the other hand, oceanic sharks that are found throughout the world’s oceans, appear to get most of their food from specific areas of cooler water in the northern and southern hemispheres. This is more like travelling long distances from rural areas to spend lots of time eating in a few restaurants in a distant city. ❝Our results suggest that for whale sharks, we can isotopically capture feeding that occurred in the months to years prior to sampling by sampling a range of slow and fast tissues, like blood plasma and fin cartilage, respectively”. Dr Wyatt added that future work looking at multiple tissues is expected to add a temporal dimension, “in this case, not only are ‘you what and where you ate’ but also ‘when you ate’❞. Carbon isotopes of different types of sharks from Bird et al. (2018) Nature Ecology & Evolution. 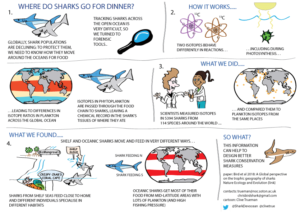 These findings are very important for Dr Wyatt, who is using isotopes to better understand the open ocean movements and foraging strategies of planktivorous sharks and rays like the whale shark. “Our results from captive whale sharks, in collaboration with Okinawa Churaumi Aquarium, have demonstrated that we can use carbon isotopes measured in different tissues of one shark to show changes in feeding activity of that individual over time” says Dr Wyatt. This is because different tissues have different rates of metabolic turnover, and can thus reflect feeding over different time scales. “Our results suggest that for whale sharks, we can isotopically capture feeding that occurred in the months to years prior to sampling by sampling a range of slow and fast tissues, like blood plasma and fin cartilage, respectively”. Dr Wyatt added that future work looking at multiple tissues is expected to add a temporal dimension, “in this case, not only are ‘you what and where you ate’ but also ‘when you ate’”. The paper ‘A global perspective on the trophic geography of sharks’ is published in the February issue of Nature Ecology & Evolution (doi 10.1038.s41559-017-0432-z).